There’s plenty of research that strongly suggests why pet ownership is important. From companionship to teaching responsibility to various health benefits, owning a pet can enrich our lives. The ideal pet to own is an individual decision and depends on many factors such as one’s lifestyle and living situation. Dogs are known as “man’s best friend”, but cats have been loyal companions to humans for thousands of years, dating back to ancient Egypt where it was believed they were first domesticated. Given a choice, why should you own a cat? Cats are fantastic at reading human emotions and acting as the ultimate stress reliever. They know when you’re sad and need to be cheered up. They know to rub against your leg, purr at you, and roll around near your feet. After a bad day, you can always count on your cat to cheer you up. 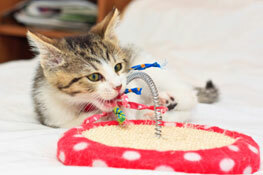 Cats are generally pretty easy to take care of compared to other animals. They absolutely adore your love and attention, but they are also independent animals. They have an obsession with keeping themselves clean. With their cleansing and deodorizing saliva, cats spend a good portion of the day grooming themselves, which makes regular bathing unnecessary. If grooming themselves isn’t enough to convince you, also remember that you don’t have to chase a cat around the yard to clean up after them. They basically housetrain themselves. They know to “do their business” in the litter box, which gives you only one small area to keep tidy. There’s no need to worry about carrying a plastic bag with you wherever you go. They are truly the perfect pet for an apartment. On that note, cats don’t need to be walked every day. While they might find the outdoors fascinating (especially if they are an indoor cat), you never need to take them outside. They are perfectly content living in and running around the house. Are you tired of chasing flies, moths and other insects around your house with a fly swatter? Cats love eyeing the flying insects and silently stalking them before springing into action. Seeing your cute and cuddly cat transform into a hunter only makes the animals that more interesting. The bond you will form with your cat will be special. 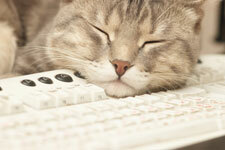 An indoor cat tends to live a very long life—on average living a few years longer than dogs. You’ll grow to love and depend on each other and your feline friend will become an irreplaceable part of your life. Cats are truly strange and bizarre creatures. To a cat lover, their behavior simply adds to their endearing qualities. You’ll never be bored trying to figure out what your cat is doing or why it is behaving the way it is. You’ll constantly wonder why your cat spends so much time hiding in boxes or why she keeps sticking her head in a shoe but you’ll also come to expect seeing your cat traipse across your keyboard while you are trying to get work done.